When you are considering improving the patient experience for your practice, think about this story. During our recent company retreat, our team went on a scavenger hunt. One item on the list was to review their experience at The Store. Charlie was right! My fall visit to The Store in Warren Vermont cost me over $100. He warned me that he never made out of this kitchenware and accessories store for less. I thought I was prepared not to spend a dime, but here is what happened to force my wallet open. I was hit by the delicious smell of pumpkin soup simmering on a warming plate, waiting for me to pour into a cup and snack on. One of the two portly owners, who obviously loves food too, and was seated behind the checkout counter, stood up to personally greet me. Then within the next few minutes, she came out from behind the counter to start a conversation. She started a conversation about where I was from, my cooking interests and more. Twenty minutes later I had my credit card out and was paying for a sushi roller and an amazing single serving microwave cooker that works really well. Since then, I’ve told dozens of people since about The Store too. How can you apply this same approach to turning patients into raving fans who send all their friends to your practice? Long wait times are patients’ number one complaint. Make sure you have solid scheduling guidelines in place to avoid overbooking providers. If things are running behind, call the patient to let them know so they can come in a few minutes later or at least be prepared for the wait. Ask the patient to make a list of any questions or concerns. Send a link to a page on your website telling them what to expect at their first appointment. Provide a form on your website, one that just asks, why did you schedule your appointment and what are your concerns or questions? Once they’ve made their appointment, tell them to use the link to provide any additional information they’d like the doctor to know. Even if patients don’t fill it in, it expresses the right attitude, which is that you care. Greet the patient. When a patient walks in the door, have your front desk staff stand up to greet them. It’s the courteous thing to do, it’s good for your front desk staff to stand up periodically, it demonstrates an interest in the patient, and makes them feel important. I don’t know about you, but I hate it when I go to a doctor’s office, and the welcome is done by someone sitting behind a counter who asks my name and then hands me a clipboard of paperwork to fill out. When you do that, you make the patient feel unimportant and like a cog in your patient factory. If they are already a patient, have the front staff greet the patient by name. If they aren’t, ask for their name and how they can help. Then, whoever is speaking to the patient…take the important step of demonstrating an interest in them by starting a conversation. Ask them how their day is, how their drive to the office was, or what they thought about the local high school football team winning last night. Ask for their opinion on something, to get a conversation going and treat them like you would a friend who walked into your house. Instead of starting the patient experience with paperwork, first, help the patient get comfortable. Where the bookshelf of free paperbacks is they can borrow (in our town you can grab these at the transfer station for free or from the library). In addition to adding amenities like coffee, cookies, and nice reading materials, take a look at your waiting area and see what it says about your practice. Is it designed to make your patients comfortable? Or are there plants dying in the corner from neglect? Is there soothing music, or is CNN loudly covering the latest breaking news? Are the chairs comfortable, or are they hard as a rock and made of chipped acrylic? Are the colors sterile, or are they warm and inviting? Nothing is more frustrating to patients than to have to provide the same information over and over before they even get to see the doctor. If you’re still asking patients to fill out physical, paper forms, chances are they have to write out their name, address, insurance information multiple times. I’ve even been to doctors’ offices where they request you spend 15 minutes filling out paperwork online, only to ask you to repeat the same paperwork in the office so there is a witness to your signature. Given I thought I’d already completed the paperwork, I hadn’t brought my reading glasses, making filling it again that much more annoying. Review your patient’s experience as if you were the patient. If you’re copying or scanning their insurance information into the computer, is it necessary to ask them to hand-write that information on multiple forms? Can you switch to a digital system where you auto-fill responses you already know so they just have to confirm the information is correct? Once you’ve made the patient feel welcome, ask for their insurance card, hand them the clipboard along with a pen, and explain what they need to fill out and what to do once they’ve filled in the form. Then, let them know if they have any questions at all, that you’re available to help. Let them know who the provider they will be seeing is. Explain what they’ll be doing with the provider and how long the wait will be. Map it all out so the patient has an understanding of how they will be spending the next 30-60 minutes. Demonstrate basic courtesy like telling them they should bring some reading material into the exam room if they’re going to waiting more than a couple of minutes. Then, if the patient is new, when the provider is ready to see them, introduce them to the patient. These small steps go a long way to making the patient feel comfortable. Patients’ perception is practitioners are trying to rush through their office visit. One simple way to alter this perception is to sit down when asking patients questions. This small gesture makes the patient experience more comfortable and they feel they are being listened to. Yes, 75% of patients’ perception is that their physicians lack empathy. If patients truly believe you care, they are willing to overlook a multitude of mistakes and much more likely to accept your recommendations. Use questions to get patients talking about themselves. Over 51% of patients felt their relationships with their doctors could be more personal. Increase patients’ perceived value of services provided. 62% felt they should have had a better patient experience considering the cost. 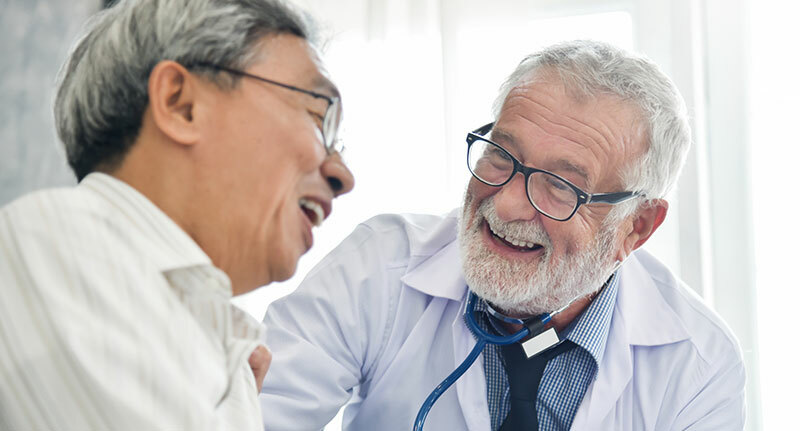 If the patient brought along someone who helps take care of them–a parent, spouse or other caretaker — and has given you permission to share medical information with them, ask the patient if it’s OK to include them in the post-examination discussion. Having caretakers present when instructions are given can lower the stress level for patients. They won’t have to repeat instructions, and if the caretakers have questions, they can ask them directly. Did you wash your hands and clean your stethoscope in front of the patient, or did you do it out of their sight? This can make a big difference to patients, especially if they can hear a patient in the next examining room with a hacking cough. Do you have a section of the waiting room designated for sick patients, or did a patient wait 20 minutes to see you for their annual well-visit while sitting next to someone with the flu? Are your exam rooms spotless, or is there a dust bunny in the corner screaming, “This room hasn’t been cleaned in a loooong time”? As a health expert you know good hygiene is crucial to your patients’ health. Look at your office with a patient’s eyes and make sure you are demonstrating the kind of cleanliness that shows an authentic interest in your patient’s health. Patients often feel rushed in doctor’s offices. One way to make sure they feel heard and not rushed is to look them in the eye while they are answering questions. 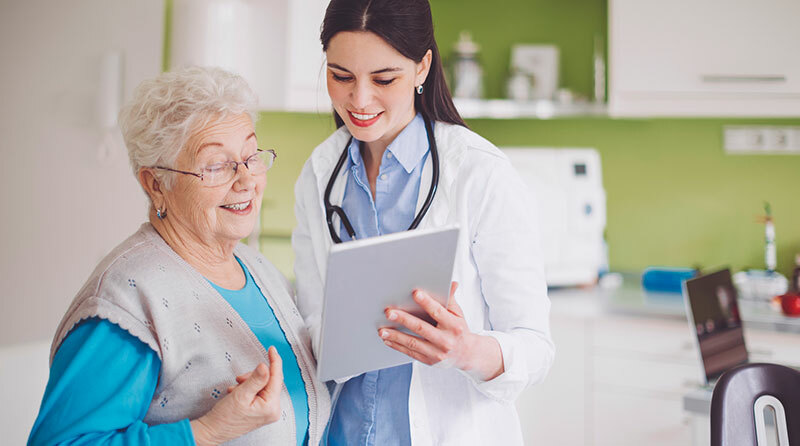 Reviewing notes, checking your smart devices, or conducting an evaluation while interviewing the patient may speed things up….but it also makes it feel more transactional to the patient. Make it a point at the beginning and end of every visit to make eye contact with the patient. A gentle reassuring hand on the patient’s shoulder or arm can go a long way to making the patient feel like a person. Not to mention the healing properties of associated with touch, can’t hurt. After you’ve given a diagnosis, offered advice, and prescribed any treatments, stop and ask your patient: are you comfortable with the treatments we discussed? Do you have any concerns with how we’re proceeding? Do you have any other questions or concerns? This final opportunity to address patient anxieties helps make the patient feel more comfortable. After the patient has finished seeing the physician or provider, have a staff member guide the patient into the front office. Again, express an interest and ask them something like, how did it go, did you get all your questions answered? Hand a patient a printed summary of their visit, including the diagnosis and recommended plan of action. Then, hand them a short form and ask them if they would provide you with their email address so you can send them a copy of their invoice and ask them for some positive feedback. When they are done, have your front desk staff stand up, shake their hand, and thank them for coming by. You’d welcome them in, shake their hand, make them feel comfortable, offer them a glass of water, and show an interest in them. You’d make them feel important. This works for the people you know and the people who are your patients. Take these simple steps and you’ll stand out from other impersonal providers in your town and generate raving fans for your practice.